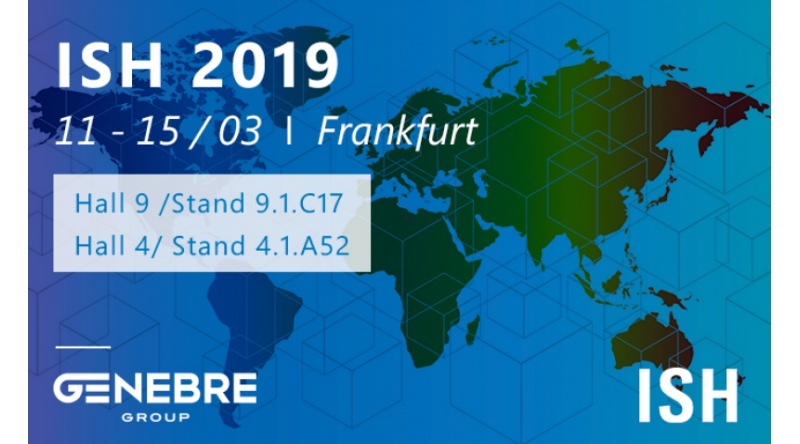 Genebre Group is participating in the new edition of the ISH Fair that will take place in Frankfurt from the 11th to the 15th of March, 2019. We have two stands to serve you: our usual stand, this year in Hall 9 (stand 9.1.C17) where we will present our Genebre Hydrosanitary and Industrial lines, and our second stand will be in Hall 4 (stand 4.1.A52), where we will present our Taps line and the Genwec Washroom Equipment products. It is an important event that has around 2,400 exhibiting companies, and the profile of the visitors is professional, making it a meeting point for engineers, architects, installation professionals, distributors and potential clients around the world. If you want to visit us at the ISH fair, please send an email to comunicacion@genebre.es, and we will send you a Day ticket voucher number. Please specify number of persons and number of days. Then you will must registered at: https://visitortickets.messefrankfurt.com/ticket/en/tickettype_select.html?_appshop=mf_tap20160620_535, where you can use to print it directly from the official website of the ISH fair in Frankfurt. We hope to be able to greet you personally at our stands at ISH Frankfurt.